Months after members of the military's nuclear force were caught cheating on their exams, Defense Secretary Chuck Hagel mapped out the group's road to recovery. "We will need to make billions of dollars of additional investments in the nuclear enterprise over the next five years," Hagel said Friday at a press conference. The Pentagon spends roughly $15 billion on its nuclear force per year, but Hagel said he wants to annually increase that amount by about 10 percent. Hagel declined to say whether the extra funding would come from shifting money around in the budget or if the Pentagon would ask Congress for more. In total, the department is implementing 100 recommendations from two reports that include increasing hiring, replacing outdated helicopters, and improving the morale of the missile crew through increases in pay and a focus on career management. The nuclear-force scandal surfaced in January, when Air Force officials said that they were investigating allegations of cheating on a monthly proficiency test at the missile base in Montana. Investigators discovered the cheating while investigating illegal drug use. A month later, the Navy said it was investigating allegations of cheating on qualifications tests by nuclear personnel in South Carolina. But Hagel said he didn't believe the cheating had threatened national security or the nuclear force as a whole. He added that the "root cause [of the problem] has been a lack of sustained focus and a strain in resources." Friday's press conference coincided with the Pentagon releasing two reviews--one internal and one external--looking into what went wrong within the nuclear-missile personnel. Two former service members led the external review. Senior Pentagon staff headed up the internal review. Despite the often critical findings in both reviews, Lt. Gen. Stephen Wilson, head of Air Force Global Strike Command, said that "we agree with everything in those reports." According to the external review, nuclear-missile personnel felt overworked, understaffed, and micromanaged. Service members also said leadership had an obsessive need for perfection and required them to perform menial tasks that didn't contribute to the force's larger mission. "A culture has evolved in which commanders accept attempts to eliminate the possibility of error in even nonessential processes and procedures through means that are so cumbersome and inefficient that overall risk to the mission increases," according to the external review. Meanwhile, the Pentagon's internal review said that problems could be boiled down to three categories: 1) known—but unaddressed—problems; 2) attempts to fix a problem that actually made the situation worse; and 3) problems of which leadership was unaware. In one instance, Hagel said, missile crews at three different bases were using one wrench to tighten parts of the missiles, and then mailing the wrench between the bases. "We now have a wrench at each location. 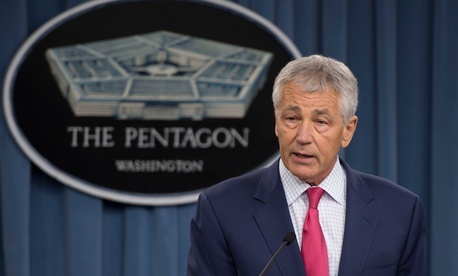 We're going to have two wrenches soon," Hagel said. He acknowledged the instance underscores "the depth and width of what has happened over the last few years. … It's indicative of a system that's been allowed to slowly back downhill." Rep. Buck McKeon, chairman of the House Armed Services Committee, came out in quick support of Hagel's recommendations, saying that the nuclear force "has suffered from neglect for too long." He added that he hopes President Obama "will listen to his senior civilian and military national security leaders, take this as seriously as they do." In 2009, Obama outlined his pledge to work toward a world without nuclear weapons. The speech detailed how the United States would cut back its weapons stockpile. McKeon said Friday that he hopes the president will "cast aside his Global Zero vision that is in reality unilateral disarmament."